Received April 27, 2018; Revised July 11, 2018; Accepted July 27, 2018. Higher productivity of new varieties is the most common target for breeders. The discovery of new quantitative trait loci (QTLs) for important traits is an effective method to support this goal. The variety Ciherang has been dominant in Indonesia for many decades. The objective of this study was to identify QTLs for agronomic and yield-related traits, especially those derived from elite variety Ciherang-Sub1. The SNP and SSR markers were used to construct a framework map for preliminary QTL analysis. In total, the 104 markers resulted in the identification of 17 QTLs from 149 backcross families. One QTL (qPH1.1) was identified in the same position across seasons. Six QTLs were confirmed by combined analysis, namely: qHd1c, qDTF3.1, qDTF11.1, qGW3.1, qGW11.1, and qY1.1. One QTL (qgy10.1) was identified from combined analysis, while 9 others were identified from one season trial, namely: qDTF1.1, qHD-6, qDTF11.2, qPH6.1, qUFG3.1, qUFG9.1, qGW2.1, qGW3.2, and qY4.1. The PVE were ranged from 4.1% to 59.5%. Five QTLs in this study were novel QTLs, namely: qDTF11.2, qUFG3.1, qUFG9.1, qGW11.1, and qY4.1. QTL alleles were detected from both parents. Interestingly, QTLs for yield were detected from the low yielding parent. These QTLs should be useful for molecular breeding in the future, since they represent elite genetic backgrounds. Importantly, the mapping populations were part of the breeding program and the best lines were advanced within the program. Furthermore, marker assisted selection (MAS) was used to make the mapping population, demonstrating an example of molecular genetics research fully integrated with actual breeding. Higher productivity is the most common target for rice researchers, especially plant breeders (Cheung 2014). Rice is extremely important in Indonesia where it is the staple food. Indonesian rice production has been increasing since 2010, reaching 73 million tons during 2016 (FAO 2017). The Indonesian Ministry of Agriculture claims that Indonesia has been able to fulfill the rice domestic needs since 2016, which came from the farmers application of new high yielding varieties (HYV) and also by rice field intensification (https://en.antaranews.com/news/114198/indonesia-has-sufficient-rice-stock-official, 10 January 2018). The Indonesian government is obliged to maintain rice self-sufficiency. Therefore, development of new HYVs with higher production is needed for the future. Yield is a complex trait, and determined by agronomic and yield components traits (Haider et al. 2012; de Bossoreille de Ribou et al. 2013; Matsubara et al. 2016). Selection for higher yield is complicated, and must involve simultaneous selection of multiple traits (Xu et al. 2011; Shabir et al. 2013; Bhat et al. 2016). Heritability, which is the genetic component of the phenotypic variation, is the main key whether the desired traits can be selected in early or advanced generations (Holland et al. 2003). Several methods have been used to develop new varieties with higher yield, from conventional to molecular breeding (Peng and Khush 2003; Peng et al. 2008; Khush 2013). These efforts increased rice yields, but the pressure of world rice demands require further improvements in rice yields (Li and Zhang 2013). Rice breeders must be creative, innovative and use new technologies, to create new rice varieties (Khush 2013; Li and Zhang 2013; Guo et al. 2014; Phitsuwan and Ratanakhanokchai 2014; Matsubara et al. 2016). Molecular breeding methods can improve efficiency of breeding (Guo et al. 2014). Quantitative trait loci (QTLs) mapping research can be applied to increase yield and yield stability in rice (Matsubara et al. 2016; Segami et al. 2016; Xu et al. 2017). QTL mapping is a method in molecular genetics that identifies the number, position, and effect of loci which control specific traits (Collard et al. 2005). QTL mapping has been extensively conducted in rice and efforts are constantly ongoing (Utami et al. 2005; Araus et al. 2008; Susanto et al. 2008; Ashraf 2010; Comas et al. 2013; Raghavan et al. 2017; Singh et al. 2017). The identification and characterization of QTLs is important to understand the genetic basis of traits and also for breeding applications (Miura et al. 2011). The objective of this study was to identify agronomic and yield-related QTLs, in backcross populations derived from the Indonesian variety Ciherang-Sub1 (INPARI 30). The original Ciherang variety has been a dominant variety in Indonesia for decades due to its consistent performance and superior performance (Ruskandar 2007; Ruskandar 2009). In Indonesia, Ciherang covered about 32% of total rice field area in 2016 (http://bbpadi.litbang.pertanian.go.id/index.php/pemetaan, 10 January 2018). Recently Ciherang- Sub1, was released to improve submergence tolerance, because flooding is a problem in Indonesia (Septiningsih et al. 2015). Nugraha et al. (2017) confirmed the phenotypic similarity between Ciherang and Ciherang-Sub1 was 87.5%. Ciherang-Sub1 was also recently used to incorporate tolerance for anaerobic germination (Toledo et al. 2015). This variety has also been released in Bangladesh (Septiningsih et al. 2015; Islam et al. 2015) due to its superior performance (Islam et al. 2013). However, despite its popularity in Indonesia, the variety needs improvement for several key traits including drought tolerance and blast resistance. Therefore, several backcross (BC) populations were developed in order to identify transgressive segregants for yield and incorporate new traits. One BC population was specifically selected to incorporate drought tolerance and identify QTLs for agronomic and yield related traits that could potentially be used for molecular breeding. Two BC1F1 populations were evaluated in this study. The backcross populations came from Ciherang-Sub1 *2 / IRBL9-W (cross number: IR112618; hereafter referred to as population ‘#105’) and Ciherang-Sub1 *2 /IRRI148 (cross number: IR112623; hereafter referred to as population ‘#109’). Ciherang-Sub1 is a well-known HYV from Indonesia because of its quality and high productivity, and also for its flash flood tolerance (Ismail et al. 2013; Septiningsih et al. 2015; Singh et al. 2017); IRBL9-W is a blast resistant variety with Pi9 gene (Koide et al. 2011; Khanna et al. 2015); while IRRI148 (or NSIC Rc192) is a well-known rainfed variety released in the Philippines and India because of its short duration and drought tolerance QTL, due to the drought QTL qDTY12.1 (Gregorio et al. 2013; Dayag et al. 2015). In this paper, we report on the QTL mapping results from population #109. A total of 364 BC1F1 were generated. After screening for qDTY12.1 using MAS following the method of Mishra and Singh (2010), a total of 184 plants were selected and 149 families were used for phenotyping. All of the field experiments were evaluated at the IRRI experimental station (altitude of about 21 m above mean sea level), under normal irrigated conditions using IRRI’s standard agronomic practices for field trials. Seedlings from the nursery were single transplanted after 21 days after sowing (DAS). The BC1F1 populations were planted during wet season 2014. The 184 individual plants for each population were planted with 20 cm × 20 cm planting distance and included parents as checks. The selected population, which was pre-screened for the specific gene/ QTL, was planted for the next two generations. Each selected plant from BC1F1 was bulked to derive seed of BC1F1:2 families. The BC1F1:3 population was generated from BC1F1:2 seeds, which was bulk-harvested from each family with no selection. No selection was performed to maintain the variation between families and to be suitable for QTL analysis. The BC1F1:2 population was planted in the dry season 2015 (DS2015) and the BC1F1:3 was in the wet season 2015 (WS2015). Individual plants of each populations were transplanted with the plant space of 20 cm × 20 cm. Each BC1F1:2 family consisted of 25 plants while on BC1F1:3 consisted of 50 plants. A randomized complete block design was used for both generations, with 3 replications including 5 checks. In addition to the two parents, three HYVs from Indonesia (Ciherang, Mekongga, and Cigeulis) were also included as checks. Limited phenotypic data on single plants was collected for the BC1F1 populations during the 2014 wet season. The observations were done for following characters: number of panicles per plant (Pn), plant height (PH), number of filled grains per plant (FG), 1000 grain weight (GW), and grain weight per plant (Y). The trait measurements followed the standard evaluation system for rice from IRRI (IRRI 2013). The BC1F1:2 and BC1F1:3 phenotypic data based on “mini plots” in the field were used for the QTL analysis. Eight traits were selected for the BC1F1:2 and BC1F1:3 phenotypic data, which were: days to 50% flowering (DTF), PH, numbers of tillers per plant (Tl), Pn, FG, number of unfilled grain per panicle (UFG), GW, and Y. Ten plants were sampled at random for measuring PH, Tl, and Pn, and then averaged as a representative of the family. Five main panicles were sampled at random for measuring FG and UFG, and then averaged as a representative of the family. GW was measured from well-developed whole grains derived from bulk seeds per family. While Y is representative of whole grains weight per family, data was converted from kilograms to tons per hectare. Moisture content was measured after weighing and used to adjust plot yield data. Normality test, homogeneity of variance test, and Spearman’s rank correlation test were analyzed using SPSS 16, while single and combine analysis of variance (ANOVA) were analyzed using SAS 9.4. The single ANOVA was done to analyze genetic variance from each planting season, while the combined ANOVA included both seasons as source of variations. The combined ANOVA across seasons will exclude the season (as environment) effect to calculate better genetic variance. Broad-sense heritability (H2bs) was calculated from single and combined ANOVA where genetic variance divided by phenotypic variance (σ2g/σ2p) (Gomez and Gomez 1984), while narrow-sense heritability (h2ns) was calculated using parent-offspring method (simple regression), where h2ns = bi × 100% (Holland et al. 2003). Genotypic and phenotypic correlation were analyzed for combined data using Meta-R 6.0 (Alvarado et al. 2017), free software available at https://data.cimmyt.org/dataset.xhtml?persistentId=hdl:11529/10201. The genotypic and phenotypic correlation were calculated to determine the correlation effect between traits, especially selected traits with respect to yield. Genotypic data was obtained from IRRI Genotyping Services Laboratory (GSL). Individual leaf samples from #105 and #109 populations were taken from individual BC1F1 plants for total genomic DNA extraction, using the CTAB method by Zheng et al. (1995) with modifications described by Collard et al. (2007). Screening for the specific genes/QTLs was performed using the BC1F1 populations to ensure the presence of the specified QTL/gene in their progenies. The Pi9 marker was used for Pi9 gene detection in population #105, while RM28199 was used for qDTY12.1 in population #109 (Mishra et al. 2013). The Fluidigm genotyping platform EP1 (96.96 array) was used for QTL analysis. Technically, all processes followed guidelines from the manufacturer (available at https://www.fluidigm.com/documents). DNA used for SNPs assay derived from single BC1F1 plants from the populations, which were screened with specified gene/QTL. A total of 288 SNP and more than 400 SSR markers were screened to find polymorphism between parents. Physical map and QTL analysis was run by QTL ICIMapping V3.2 software (Meng et al. 2015), free software available at https://www.isbreeding.net. The polymorphic and appropriate markers were determined by following the instructions given by Meng et al. (2015). The inclusive composite interval mapping method (ICIM) was used for the QTL mapping method. The Kosambi map function was used for physical analysis and significance levels for QTL analysis were identified using 5000 permutations. The QTL nomenclature followed gene nomenclature system for rice (McCouch and CGSNL 2008). QTLs detected from this study were compared to the previous studies, based on the specific trait and map information, using the Gramene QTL database (http://archive.gramene.org/qtl/) and QTARO database (http://qtaro.abr.affrc.go.jp/qtab/table#as_table:21:undefined:undefined). Trait analysis focused on yield and yield-related traits but also included agronomic traits. About 55% of population #109 individual BC1F1 had higher yield than the best parent IRRI148, while from population #105 only 19% individual BC1F1 had higher yield than IRBL9-W (Fig. 1) indicating transgressive segregation. A histogram for plant height indicated bimodal distribution for #105 and #109, in which about 33% from #105 were taller than IRBL9-W and about 49% from #109 were taller than IRRI148. This result indicated the segregation of a major gene. The other traits displayed normal distribution patterns (Table 1). Based on the relevance to breeding objectives and trait data, #109 was chosen for QTL analysis. Screening of the qDTY12.1 for the #109 was performed for 184 individual plants, where 149 plants were identified having the specified QTL (qDTY12.1). Each plant was advanced (1 generation per season) to derive BC1F1:2 and BC1F1:3 families. The 149 families of #109 BC1F1:2 and BC1F1:3 population performances in the field using agronomic management practices at IRRI (Table 2). The performance of BC1F1:2 and BC1F1:3 were not distinct for most of the observed traits, except for PH and Y. PH were taller about 22.5 cm in average while yield was decline about 27% in average during WS. Two families were identified having a stable yield, the other 2 families were increased for 15%, and 1 family was increased for 32%. The yield performance of Ciherang-Sub1 was reduced by about 49% during WS, while IRRI148 yield performance was stable (specified data not shown). All of the observed traits were suitable for further parametric analysis (single ANOVA) based on the standard tests results, except for PH. While DTF, GW, and Y were the enabled traits for combined ANOVA analysis (Table 2). The H2 range during DS was 10.3% (Tl) to 60% (GW), while during WS was 1.6% (Tl) to 48.8% (GW). Most of the observed traits had higher H2 during the DS than the WS, except for yield where the H2 during WS was higher than DS. The highest h2 was for GW, followed by DTF and Y (Table 3). The genotypic correlation coefficient (GCC) for all selected traits were having significant effect to the yield with positive values, except for DTF and UFG. The GCC for Tl was not detected. Significant effect to the yield was also found for the phenotypic correlation coefficient (PCC), except for UFG. The strongest PCC to the yield was from PH (0.83) and FG (0.78), while DTF has negative value (−0.74) (Table 4). From the 288 SNP markers and more than 400 SSR markers screened for polymorphism using the Fluidigm system, 97 SNP and 7 SSR markers were found to be polymorphic between parents. These markers were distributed to all 12 rice chromosomes with 3.09 Mbp interval on average. The average marker interval distance (Mbp) for chromosomes 1 to 12 were: 4.82, 3.74, 2.97, 4.94, 2.99, 2.50, 3.31, 2.45, 1.51, 3.71, 1.65, and 2.49, respectively. Seventeen QTLs were identified from #109, where 10 QTLs were identified in the BC1F1:2 (DS), 6 QTLs were identified in the BC1F1:3 (WS), and 1 QTL was identified from yield combined data (C). One QTL was identified in the same position in both generations, which was for PH at chromosome 1 (Table 5). QTL analysis was also performed based on the combined data, for DTF, GW, and Y. The combined analysis resulted in 8 QTLs with large effect including 3 QTLs for DTF (PVE = 32.5%), 3 QTLs for GW (PVE = 39.6%), and 2 QTLs for Y (PVE = 21.9%) (Table 5). 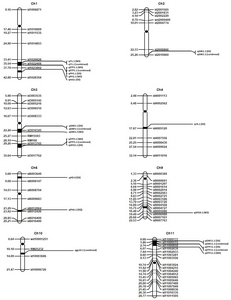 All of the identified QTL positions were shown on Fig. 2. Five QTLs from this study were novel QTLs, while 12 others were located in the same regions as in previous studies (Table 6). The nomenclature for the previous identified QTLs followed the considerations of: 1) QTLs identified from this study having the same or similar flanking marker positions following previous nomenclature; 2) QTLs identified from this study that had closer flanking marker position range than the previous known QTLs (more accurate position) were given their own name in this study. Two new QTLs for UFG were identified on chromosome 3 (qUFG3.1 at 30.9835 Mbp) and on chromosome 9 (QUFG9.1 at 17.3273 Mbp). One QTL for DTF was located on chromosome 11 (qUFG11.2 at 3.6827 Mbp). For GW, one QTL was located on chromosome 11 (qGW11.1 at 1.6827 Mbp). Importantly for yield, a QTL was located on chromosome 4 (qY4.1 at 17.4846 Mbp). Three QTLs identified in this study were located in the same positions as in previous studies: 1) qHd1c (40.56 – 41.54 Mbp) for heading date located on chromosome 1, while in this study the QTL was identified at 37.79 to 42.88 Mbp; 2) qHD-6 (5.80 – 8.06 Mbp) for heading date on chromosome 6, in this study was located at 5.68 to 9.68 Mbp; and 3) qgy10.1 (12.68–12.68 Mbp) for yield on chromosome 10, in this study was located at 10.17 to 14.09 Mbp. Based on previous nomenclature QTLs were probably equivalent: qDTF1.1 (previously Hd1), qDTF3.1 (previously qDTH-3), qDTF11.1 (previously unpublished QTL name), qPH1.1 (previously ph1), qPH6.1 (previously ph6), qGW2.1 (previously yld2.1), qGW3.1 (previously qLWR-3), qGW3.2 (previously gw3.1), and qY1.1 (previously yd1) (Table 6). The additive value of QTLs was compared with the observation data. Ciherang-Sub1 as the recurrent parent was defined to have the “AA” genotype, and IRRI148 as donor parent was defined to have the “aa” genotype. The BC population, which was heterozygous, was defined to have “Aa” genotypes. Allelic substitution indicates that “A” allele was substituted with “a” allele which came from the donor parent. The QTL results indicated that all of the DTF and GW QTL alleles were derived from Ciherang-Sub1, except for qGW2.1. The qPH6.1 and qUFG3.1 also had positive additive values. These QTLs ranged from 0.6 to 4.5. While all of the yield QTLs (qY1.1, qY4.1, and qgy10.1), qPH1.1, qUFG9.1, and qGW2.1 were derived from the IRRI148 parent, and ranged from −20.4 to −0.5 (Table 7). The identification of QTLs for important traits is extremely useful for molecular geneticists and breeders. In addition to providing information about the genetic architecture of traits, it can permit breeders to select for QTLs with moderate or large effects using marker assisted selection (MAS). Despite the importance of the Ciherang genetic background for Indonesia, relatively few QTL mapping studies have used this elite variety as a parent in mapping populations. One exception was the recent study by Singh et al. (2017) who used a recombinant inbred line (RIL) mapping population derived from a Ciherang-Sub1/IR10F365 cross to map QTLs agronomic traits and tolerance to stagnant flooding. Ciherang-Sub1 (rather than the original variety) was used as parent because Ciherang- Sub1 is essentially an upgrade of the recipient variety and the presence of the Sub1 gene in this variety is highly desirable for breeding and the development of new varieties (Septiningsih et al. 2015). QTL mapping and molecular breeding activities are often disconnected. One reason is the relevance of mapping populations to breeding programs. In our study, however, we specifically tried to ensure that the mapping populations developed were highly relevant to the breeding activities targeting Indonesia at IRRI, by engaging with Indonesian collaborators and making targeted crosses. Furthermore, all trait evaluation was performed within the actual breeding program ensuring full integration. Several breeding/mapping populations were developed at IRRI for the objective to improve specific traits in Ciherang, such as blast resistance and drought tolerance, and obtain transgressive segregation for yield. Rieseberg et al. (1999) in their review predicted that transgressive segregation occurs more commonly in intra-specific hybridization than inter-specific hybridization and the similarity of the parents will be important, where more similar parents will increase the transgressive phenotypes. This was observed in our study since there were more transgressive segregants for yield in population #109 than #105, where the genotypes with better performance than parents in #109 were higher than #105. Parents of #109, Ciherang-Sub1 (indica) and IRRI148 (indica), were more genetically similar than parents of #105, Ciherang-Sub1 (indica) and IRBL9-W (tropical japonica), although Ciherang-Sub1 and IRRI148 were still relatively diverse parents based on pedigree information. However, we only tested two populations. Based on our empirical observations, the #109 population used for QTL mapping. Traits that affected by the different planting season condition were PH and Y, where the average of plant height was taller during the wet season, while in contrast, the wet season yield average (5 t/ha) was lower than the dry season (7 t/ha). This was caused by the cloudy conditions during WS that reduce solar radiation interception, where the plants grow higher with lower yield, which is well known to occur at the IRRI experiment station. IRRI148 had a more stable yield than Ciherang-Sub1. Ciherang is an Indonesian variety that is not well adapted to the climate in the Philippines. Septiningsih et al. (2015) also reported that yield of Ciherang and Ciherang-Sub1 was higher during dry season than wet season in irrigated field of IRRI Philippines. IRRI148 was developed in the Philippines and hence was more stable across seasons. The Ciherang-Sub1 is more appropriate to be planted during the dry season at the Philippines (season specific), especially at the Los Banos region. The stable performance of IRRI148 was inherited in some of the offspring, where several families had more stable yield than others. These families were retained for further generation advancement and selection in the breeding program. Trait heritability from BC1F1:3 populations were mostly lower than BC1F1:2, except for Y. This might be due to the increased incidence of pests and diseases, and bad weather which is common during wet season at Philippines. Field conditions during WS usually have higher damage caused by insects and diseases and also by stormy weather, which may have caused the lower heritability for Tl and Pn during WS. The h2 estimation based on the combined data analysis resulted high heritability for DTF (65%) and GW (69%), while yield unexpectedly had a moderate h2 (31%). These findings are quite encouraging for breeding and QTL analysis to find new and consistent QTLs in this study. All of the agronomic and yield selected traits in this study were statistically significant and had significant effects regarding yield performance for GCC, except Tl. These traits are strongly recommended to be applied and observed as the direct selection criteria for yield selection in the field. Of the 288 SNPs and more than 400 SSR markers tested, about 15% were polymorphic and conformed with the expected segregation ratio for BC1F1 population (50% recurrent parent: 50% hybrid). The low proportion of polymorphic markers was probably due to the genetic similarity between the parents in specific genomic areas. Ciherang and IRRI148 were basically derived from Green Revolution varieties such as IR64 and IR42, have many common ancestors in their pedigrees. This relatedness may cause difficulty in finding the polymorphic markers. Based on the average interval distance between markers, the 104 markers were adequate to perform a preliminary QTL analysis based on a framework map (Collard et al. 2005), but further research will be required to fully map all 12 rice chromosomes (Tan et al. 2013; Meng et al. 2015). The ICIM was used rather than interval mapping (IM) for QTL mapping, to increase the QTL detection and decreasing false positive QTL that may occur on small population size (< 200) (Li et al. 2010; Raghavan and Collard 2012). Several previous studies showed the detection of QTLs identified in the same position as in our study, which suggests that these QTLs are genuine. However, novel QTLs for traits with moderate to high h2 were also identified in this study and may be useful for future rice breeding improvement. Once validated, these QTLs would be ideal targets to be utilized for QTL-pyramiding, to enhance targets traits including higher yield (Miura et al. 2011; de Bossoreille de Ribou et al. 2013; Leung et al. 2015; Xu et al. 2016; Matsubara et al. 2016; Raghavan et al. 2017). In conclusion, 17 QTLs were identified from BC population of Ciherang-Sub1*2/IRRI148. Five of them were newly identified QTLs, which were: qDTF11.2, qUFG3.1, qUFG9.1, qGW11.1, and qY4.1, while 12 of them were identified in the same regions as in previous studies. By exploring the additive effects from the QTL analysis, QTL alleles were contributed by both parents. This is consistent with the transgressive segregation observed for the trait data. Most interestingly, yield QTLs were contributed from the low-yielding donor parent IRRI 148 which indicated that this parent contributed favorable alleles in backcross lines that increased the yield performance relative to the recurrent parent, Ciherang-Sub1. 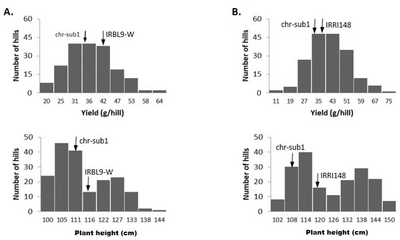 The alleles from parent IRRI148 were able to reduce flowering time, increase plant height, reduce grain weight, and increase yield of the BC populations compared to Ciherang-Sub1. Ideally, all of these preliminary QTL findings need to be verified in fixed breeding lines in the future. This study is a part of final assignment of IPB’s Doctoral degree funded by IAARD scholarship. The experiments and travel were funded by the Lee Foundation Scholarship. Fig. 1. Individual yield and plant height segregation of BC1F1 population. Population #105 (A. Ciherang-Sub1*2/IRBL9-W) and population #109 (B. Ciherang-Sub1*2/IRRI148). More transgressive segregants were observed from #109. Fig. 2. QTL positions for yield and agronomic traits. DS means the QTLs were detected during dry season, while WS means the QTLs detected during wet season. Combined means the QTLs were derived from combined data. Performance of BC1F1 population #105 and #109 compared with parents. Descriptive statistic of population no 109 BC1F1:2 (DS) and BC1F1:3 (WS) compared with parents, Ciherang-Sub1 and IRRI148. DTF = days to 50% flowering (DAS); PH = plant height (cm); Tl = number of tillers per plant; Pn = number of panicles per plant; FG = filled grain per panicle; UFG = unfilled grain per panicle; GW = thousand grain weight (g); Y = yield (t/ha). KS = Kolmogorov-Smirnov normality test; B = Bartlett homogeneity test; Sp = Spearman rank correlation. Estimated heritability of #109 BC1F1:2 and BC1F1:3 from ANOVA. DTF = days to 50% flowering (DAS); PH = plant height (cm); Tl = number of tillers per plant; Pn = panicles per plant; FG = no. of filled grain per panicle; UFG = no. of unfilled grain per panicle; GW = thousand grain weight (g); Y = yield (t/ha). MSg = mean of square of genotype. MSge = mean of square of genotype × season. CV = coefficient of variation (%). H2 = broad-sense heritability (%). h2 = narrow-sense heritability (%), estimated from parent-offspring regression. Genotypic correlation (below diagonal) and phenotypic correlation (upper diagonal) between traits from combined dataset. DTF = days to 50% flowering (DAS); PH = plant height (cm); Tl: number of tiller; Pn: Number of panicle; FG = number of filled grain per panicle; UFG = number of unfilled grain per panicle; GW = thousand grain weight (g); Y = yield (t/ha). QTLs position derived from Ciherang-Sub1 backcross population (#109). DTF = days to 50% flowering (DAS); PH = plant height (cm); UFG = no. of unfilled grain per panicle; GW = thousand grain weight (g); Y = yield (t/ha). QTL pos = QTL physical position. LOD = logarithm of the odds ratio. PVE = phenotypic variance explained. found on single QTL analysis. QTLs identification from previous studies. DS = dry season (BC1F1:2); WS = wet season (BC1F1:3); C = combined data. Bold letters are the QTLs name reference from the previous studies; None = unpublished QTL name. based on gramene.org and QTARO databases. Allelic substitution effect and additive value of QTLs. Positive values indicate QTL alleles were contributed by the Ciherang-Sub1 parent whereas negative values were contributed by the IRRI148 parent. DTF = days to 50% flowering (DAS); PH = plant height (cm); UFG = number of unfilled grain per panicle; GW = thousand grain weight (g); Y = yield (t/ha). Araus, JL, Slafer, Ga, Royo, C, and Serret, MD (2008). Breeding for yield potential and stress adaptation in cereals. Critical Reviews in Plant Science. 27, 377-412. Ashraf, M (2010). Inducing drought tolerance in plants: recent advances. Biotechnol Adv. 28, 169-183. Bhat, JA, Ali, S, Salgotra, RK, Mir, ZA, Dutta, S, and Jadon, V (2016). Genomic selection in the era of next generation sequencing for complex traits in plant breeding. Front Genet. 7, 221. Cai, HW, and Morishima, H (1998). Mapping QTLs for heading behavior using RI population derived from a cross between wild and cultivated rice strains. Rice Genet News. 15, 144-146. Cao, GQ, Zhu, J, He, CX, Gao, YM, and Wu, P (2001). QTL analysis for epistatic effects and QTL x environment interaction effects on final height of rice (Oryza sativa L.). Acta Genetica Sinica. 28, 135-143. Cheung, F (2014). Yield: The search for the rice of the future. Nature. 514, S60-S61. Collard, BCY, Das, A, Virk, PS, and Mackill, DJ (2007). Evaluation of “quick and dirty” DNA extraction methods for marker-assisted selection in rice (Oryza sativa L.). Plant Breed. 126, 47-50. Collard, BCY, Jahufer, MZZ, Brouwer, JB, and Pang, ECK (2005). An introduction to markers, quantitative trait loci (QTL) mapping and marker-assisted selection for crop improvement: The basic concepts. Euphytica. 142, 169-196. Comas, LH, Becker, SR, Cruz, VM, Byrne, PF, and Dierig, DA (2013). Root traits contributing to plant productivity under drought. Front Plant Sci. 4, 442. Cui, K, Peng, S, Ying, Y, Yu, S, and Xu, C (2004). Molecular dissection of the relationships among tiller number, plant height and heading date in rice. Plant Prod Sci. 7, 309-318. Dayag, DMC, Soriano, JB, Valdez, JA, and Villacorta, GM (2015). Aerobic Rice Production System (ARPS): improving productivity and profitability in water-scarce areas of Bulacan. Ann Trop Res. 37, 44-53. (2013). Plant science and agricultural productivity: why are we hitting the yield ceiling?. Plant Sci. 210, 159-176. Gregorio, GB, Islam, MR, Vergara, GV, and Thirumeni, S (2013). Recent advances in rice science to design salinity and other abiotic stress tolerant rice varieties. SABRO Journal of Breeding and Genetics. 45, 31-41. Guo, L, Gao, Z, and Qian, Q (2014). Application of resequencing to rice genomics, functional genomics and evolutionary analysis. Rice. 7, 4. Haider, Z, Khan, AS, and Zia, S (2012). Correlation and path co-efficient analysis for yield and its components in rice (Oryza sativa L.) under simulated drought stress condition. American-Eurasian J Agric Environ Sci. 12, 100-104. Hemamalini, GS, Shashidhar, HE, and Hittalmani, S (2000). Molecular marker assisted tagging of morphological and physiological traits under two contrasting moisture regimes at peak vegetative stage in rice (Oryza sativa L.). Euphytica. 112, 69-78. Hittalmani, S, Huang, N, Courtois, B, Venuprasad, R, Shashidhar, HE, and Zhuang, JY (2003). Identification of QTL for growth- and grain yield-related traits in rice across nine locations of Asia. Theor Appl Genet. 107, 679-690. Hua, J, Xing, Y, Wu, W, Xu, C, Sun, X, and Yu, S (2003). Single-locus heterotic effects and dominance by dominance interactions can adequately explain the genetic basis of heterosis in an elite rice hybrid. Proc Natl Acad Sci USA. 100, 2574-2579. Islam, M, Begum, S, Hassan, A, Iqbal, M, and Islam, M (2015). BINA dhan11 and BINA dhan12, two flash flood tolerant Aman rice varieties. Leaflet. Islam, M, Sohel, MH, Hoque, M, Begum, S, and Khanom, S (2013). Evaluation of submergence tolerant rice genotypes for flood prone areas of Bangladesh. Bangladesh J Nucl Agric. 29, 49-57. Ismail, AM, Singh, US, Singh, S, Dar, MH, and Mackill, DJ (2013). The contribution of submergence-tolerant (Sub1) rice varieties to food security in flood-prone rainfed lowland areas in Asia. Field Crops Res. 152, 83-93. Khanna, A, Sharma, V, Ellur, RK, Shikari, AB, Gopala Krishnan, S, and Singh, UD (2015). Development and evaluation of near-isogenic lines for major blast resistance gene(s) in Basmati rice. Theor Appl Genet. 128, 1243-1259. Khush, GS (2013). Strategies for increasing the yield potential of cereals: Case of rice as an example. Plant Breed. 132, 433-436. Koide, Y, Ebron, LA, Kato, H, Tsunematsu, H, Telebanco-Yanoria, MJ, and Kobayashi, N (2011). A set of near-isogenic lines for blast resistance genes with an Indicatype rainfed lowland elite rice (Oryza sativa L.) genetic background. Field Crops Res. 123, 19-27. Lafitte, HR, Courtois, B, and Arraudeau, M (2002). Genetic improvement of rice in aerobic systems: progress from yield to genes. Field Crops Res. 75, 171-190. Lanceras, JC, Pantuwan, G, Jongdee, B, and Toojinda, T (2004). Quantitative trait Loci associated with drought tolerance at reproductive stage in rice. Plant Physiol. 135, 384-399. Leung, H, Raghavan, C, Zhou, B, Oliva, R, Choi, IR, and Lacorte, V (2015). Allele mining and enhanced genetic recombination for rice breeding. Rice. 1, 34. Li, H, Hearne, S, Banziger, M, Li, Z, and Wang, J (2010). Statistical properties of QTL linkage mapping in biparental genetic populations. Heredity (Edinb). 105, 257-267. Li, ZK, Pinson, SR, Park, WD, Paterson, AH, and Stansel, JW (1997). Epistasis for three grain yield components in rice (Oryza sativa L.). Genetics. 145, 453-465. Li, ZK, Yu, SB, Lafitte, HR, Huang, N, Courtois, B, and Hittalmani, S (2003). QTL x environment interactions in rice. I. heading date and plant height. Theor Appl Genet. 108, 141-153. Li, ZK, and Zhang, F (2013). Rice breeding in the post-genomics era: From concept to practice. Curr Opin Plant Biol. 16, 261-269. Lu, CF, Shen, LH, He, P, Chen, Y, Zhu, L, and Tan, Z (1997). Comparative mapping of QTLs for agronomic traits of rice across environments by using a doubled-haploid population. Theor Appl Genet. 94, 145-150. Marri, PR, Sarla, N, Reddy, LV, and Siddiq, EA (2005). Identification and mapping of yield and yield related QTLs from an Indian accession of Oryza rufipogon. BMC Genet. 6, 33. Matsubara, K, Yamamoto, E, Kobayashi, N, Ishii, T, Tanaka, J, and Tsunematsu, H (2016). Improvement of rice biomass yield through QTL-based selection. PLoS One. 11, e0151830. McCouch, SR, and CGSNL (Committee on Gene Symbolization, Nomenclature and Linkage, Rice Genetics Cooperative) (2008). Gene nomenclature system for rice. Rice. 1, 72-84. Mei, HW, Luo, LJ, Ying, CS, Wang, YP, Yu, XQ, and Guo, LB (2003). Gene actions of QTLs affecting several agronomic traits resolved in a recombinant inbred rice population and two testcross populations. Theor Appl Genet. 107, 89-101. Meng, L, Li, H, Zhang, L, and Wang, J (2015). QTL IciMapping: Integrated software for genetic linkage map construction and quantitative trait locus mapping in biparental populations. Crop J. 3, 269-283. Mishra, AK, and Singh, VP (2010). A review of drought concepts. J Hydrol. 391, 202-216. Mishra, KK, Vikram, P, Yadaw, RB, Swamy, BPM, Dixit, S, and Cruz, MTS (2013). qDTY12.1: A locus with a consistent effect on grain yield under drought in rice. BMC Genet. 14, 12. Miura, K, Ashikari, M, and Matsuoka, M (2011). The role of QTLs in the breeding of high-yielding rice. Trends Plant Sci. 16, 319-326. Nugraha, Y, Hidayatun, N, and Yuliani, D (2017). Phenotypic performance of Ciherang-Sub1 near isogenic line as an adaptive variety for flooding conditions. Indones J Agric Sci. 18, 7-16. Peng, S, and Khush, GS (2003). Four decades of breeding for varietal improvement of irrigated lowland rice in the International Rice Research Institute. Plant Prod Sci. 6, 157-164. Peng, S, Khush, GS, Virk, P, Tang, Q, and Zou, Y (2008). Progress in ideotype breeding to increase rice yield potential. Field Crops Res. 108, 32-38. Phitsuwan, P, and Ratanakhanokchai, K (2014). Can we create “Elite Rice”—a multifunctional crop for food, feed, and bioenergy production?. Sustainable Chemical Processes. 2, 10. Raghavan, C, and Collard, BCY (2012). Effect of small mapping population sizes on reliability of quantitative trait locus (QTL) mapping. African J Biotechnol. 11, 10661-10674. Raghavan, C, Mauleon, R, Lacorte, V, Jubay, M, Zaw, H, and Bonifacio, J (2017). Approaches in characterizing genetic structure and mapping in a rice multiparental population. G3. 7, 1721-1730. Rieseberg, LH, Archer, MA, and Wayne, RK (1999). Transgressive segregation, adaptation and speciation. Heredity (Edinb). 83, 363-372. Ruskandar, A (2007). Penyebaran padi unggul baru di Jawa Barat. War Penelit dan Pengemb Pertan. 29, 5-6. Ruskandar, A (2009). Varietas Ciherang makin mendominasi. War Penelit dan Pengemb Pertan. 31, 11-13. Segami, S, Yamamoto, T, Oki, K, Noda, T, Kanamori, H, and Sasaki, H (2016). Detection of novel QTLs regulating grain size in extra-large grain rice (Oryza sativa L.) lines. Rice. 9, 34. Septiningsih, EM, Hidayatun, N, Sanchez, DL, Nugraha, Y, Carandang, J, and Pamplona, AM (2015). Accelerating the development of new submergence tolerant rice varieties: the case of Ciherang-Sub1 and PSB Rc18-Sub1. Euphytica. 202, 259-268. Shabir, G, Amir Naveed, S, and Arif, M (2013). Estimation of phenotypic variability and mutual association of yield and its components in rice (Oryza sativa L.) germplasm using multivariate analysis. J Agric Res. 51, 361-377. Singh, A, Carandang, J, Gonzaga, ZJC, Collard, BCY, Ismail, AM, and Septiningsih, EM (2017). Identification of QTLs for yield and agronomic traits in rice under stagnant flooding conditions. Rice. 10, 15. Susanto, U, Aswidinnoor, H, Koswara, J, Setiawan, A, Lopena, V, and Torizo, L (2008). QTL mapping of yield, yield components, and morphological traits in rice (Oryza sativa L.) using SSR marker. Bul Agron. 36, 188-195. Takeuchi, Y, Hayasaka, H, Chiba, B, Tanaka, I, Shimano, T, and Yamagish, M (2001). Mapping quantitative trait loci controlling cool-temperature tolerance at booting stage in temperate Japonica rice. Breed Sci. 51, 191-197. Tan, C, Han, Z, Yu, H, Zhan, W, Xie, W, and Chen, X (2013). QTL Scanning for Rice Yield Using a Whole Genome SNP Array. J Genet Genomics. 40, 629-638. Thomson, MJ, Tai, TH, McClung, AM, Lai, XH, Hinga, ME, and Lobos, KB (2003). Mapping quantitative trait loci for yield, yield components and morphological traits in an advanced backcross population between Oryza rufipogon and the Oryza sativa cultivar Jefferson. Theor Appl Genet. 107, 479-493. Toledo, AMU, Ignacio, JCI, Casal, C, Gonzaga, ZJ, Mendioro, MS, and Septiningsih, EM (2015). Development of improved Ciherang-Sub1 having tolerance to anaerobic germination conditions. Plant Breed Biotech. 3, 77-87. Utami, DW, Moeljopawiro, S, Aswidinnoor, H, Setiawan, A, and Guhardja, E (2005). Analisis lokus kuantitatif sifat ketahanan penyakit blas pada populasi antarspesies IR64 dan Oryza rufipogon. J Bioteknol Pertan. 10, 7-14. Wan, XY, Wan, JM, Weng, JF, Jiang, L, Bi, JC, and Wang, CM (2005). Stability of QTLs for rice grain dimension and endosperm chalkiness characteristics across eight environments. Theor Appl Genet. 110, 1334-1346. Xiao, J, Grandillo, S, Ahn, SN, McCouch, SR, Tanksley, SD, and Li, J (1996). Genes from wild rice improve yield. Nature. 384, 223-224. Xing, Z, Tan, F, Hua, P, Sun, L, Xu, G, and Zhang, Q (2002). Characterization of the main effects, epistatic effects and their environmental interactions of QTLs on the genetic basis of yield traits in rice. Theor Appl Genet. 105, 248-257. Xu, F, Jin, L, Huang, Y, Tong, C, Chen, Y, and Bao, J (2016). Association mapping of quantitative trait loci for yield-related agronomic traits in rice (Oryza sativa L.). J Integr Agric. 15, 2192-2202. Xu, Q, Yuan, XP, Yu, HY, Wang, YP, Tang, SX, and Wei, XH (2011). Mapping QTLs for drought tolerance at seedling stage in rice using doubled haploid population. Rice Sci. 18, 23-28. Xu, Y, Li, P, Yang, Z, and Xu, C (2017). Genetic mapping of quantitative trait loci in crops. Crop J. 5, 175-184. Yamamoto, T, Taguchi, SF, Ukai, Y, Sasaki, T, and Yano, M (2001). Mapping quantitative trait loci for days-to-heading, and culm, panicle and internode lengths in a BC1F3 population using an elite rice variety, Koshihikari, as the recurrent parent. Breed Sci. 51, 63-71. Yan, J, Zhu, J, He, C, Benmoussa, M, and Wu, P (1999). Molecular marker-assisted dissection of genotype X environment interaction for plant. Crop Sci. 39, 538-544. Zheng, KL, Subudhi, PK, Domingo, J, Magpantay, G, and Huang, N (1995). Rapid DNA isolation for marker assisted selection in rice breeding. Rice Genet News. 12, 255-258. Zhuang, JY, Fan, YY, Wu, JL, Xia, YW, and Zheng, KL (2001). Comparison of the detection of QTL for yield traits in different generations of a rice cross using two mapping approaches. Acta Genetica Sinica. 28, 458-464.